Regulates perspiration over 48 hours;Ensures freshness and smoothness. 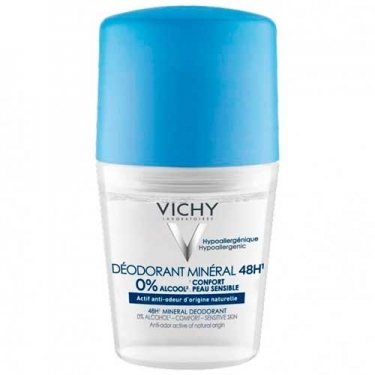 Déodorant Minéral Sans sels daluminium da Vichy from a deodorant roll-on, mineral, without aluminum and ideal for sensitive skin. It contains in its formulation an association of zinc gluconate and minerals of the mineralizing water of the brand for an anti-odor efficiency up to 48h, with soothing provitamin B5. Great tolerance even on sensitive skin.